Susie and Warren Harshman had never stayed at a bed and breakfast. And then they bought one. 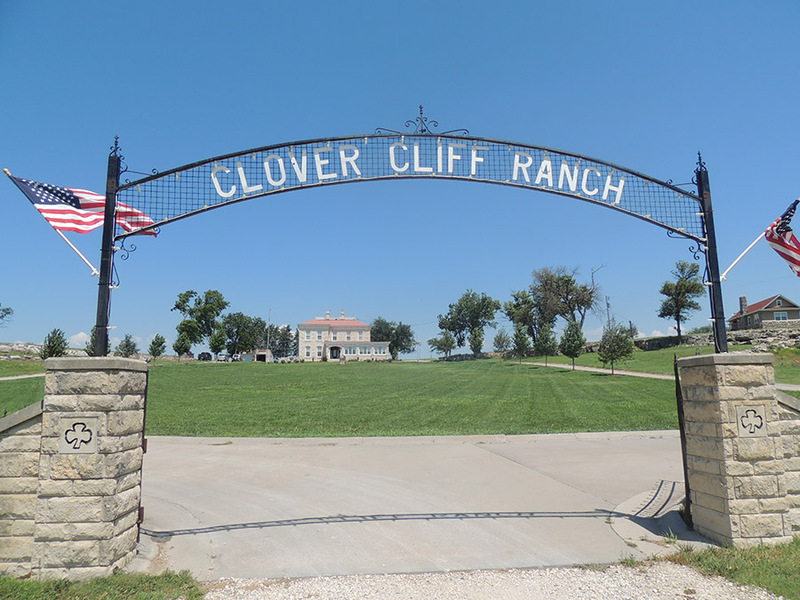 When the opportunity to purchase the Clover Cliff Ranch Bed and Breakfast in Elmdale fell through six years ago, the Harshmans said they thought their chance had passed. But when the historic limestone home and the 3,300 acres it rests on were auctioned in February 2014, the couple weighed the decision a second time. Though Warren and Susie also own a rock quarrying business, a wheat farm and a fully operational cattle ranch, caring for people at Clover Cliff is their primary focus at the moment. Both of the Harshmans have sentimental childhood connections to the Clover Cliff Ranch. Warren grew up mere miles from the ranch, and Susie’s grandfather was friends with the Prather family who owned it for the majority of the 20th Century. Additionally, the couple was friends with the Donahue family who owned the estate last. Purchasing the establishment meant the couple had a decision to make: leave home to live at Clover Cliff or drive the three miles multiple times a day. The pair opted for the short drive. The land the Harshmans reside on has been in Warren’s family for four generations, and their home was built by his grandfather. Both factors played a role in the decision to not move to the estate. When Susie and Warren purchased the Clover Cliff, peak tourism season was just around the corner. The pair, in a rush to furnish the main house by April 2014, found two shops specializing in period furniture in North Carolina. The mad furniture scramble paid off, and everything was in place by the time the first visitors arrived. Clover Cliff had a steady stream of visitors ever since. Service is the main objective for the Harshmans, they said. Their desire to attend the public in this way stems from their Christian faith, they explained. “We feel like God calls us to love him and serve people, and so that’s what we’re doing,” Susie said. Part of the couple’s ministry is getting to know their guests, Susie explained. But that can sometimes be tricky because they don’t want to monopolize guests’ time, she said. Breakfast is the one time the Harshmans can take time to fully engage with their guests. 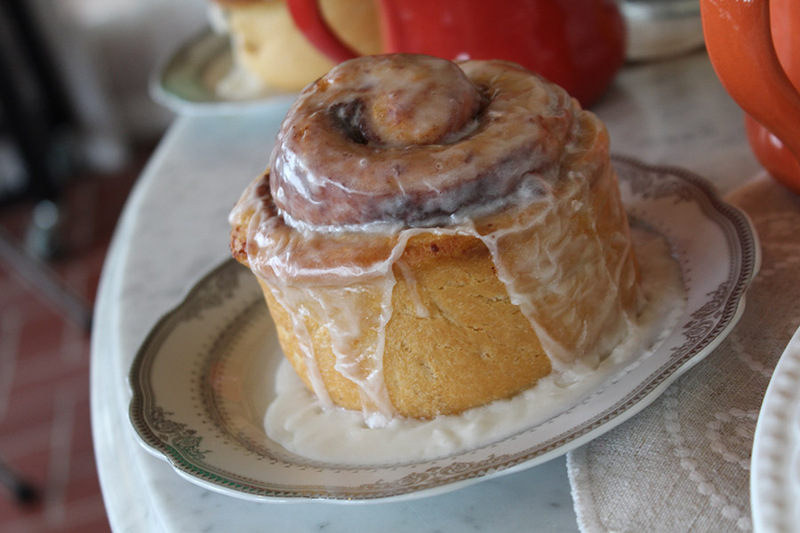 At breakfast-time, the scent of plate-sized, homemade cinnamon rolls fills the air. Chatter from dining guests on the enclosed front porch can be heard from the hallway. Warren greets the guests as they stroll in, offering coffee and bringing the first round of breakfast — a bowl of brightly colored fruit topped with freshly whipped cream — as visitors get settled. Susie sets the daily menu and bakes each meal individually as people are ready to eat. Typically, breakfast is served at 8 a.m., but the Harshmans are always willing to accommodate guests’ schedules, they said. Sometimes the meals require less preparation time, and Susie gets a chance to mingle and serve alongside Warren. Helping one another is part of the Harshman family’s makeup. Daughters-in-law help Susie with breakfast and serving when the house is fuller. The couple’s four sons are all involved in one of the family businesses; Burton, Sam and Casey Harshman work in the rock crushing business Warren founded with his father, grandfather and brothers, and Spencer Harshman works on the family’s ranch. Even the grandchildren are in on the action. And there are plenty of them. With 12 grandkids and one on the way, many hands are available to help around the property. One grandson helps keep up with the mowing, and he painted the gable house this summer. Another granddaughter, at the ripe old age of 7, wanted to try her hand at serving meals to guests. 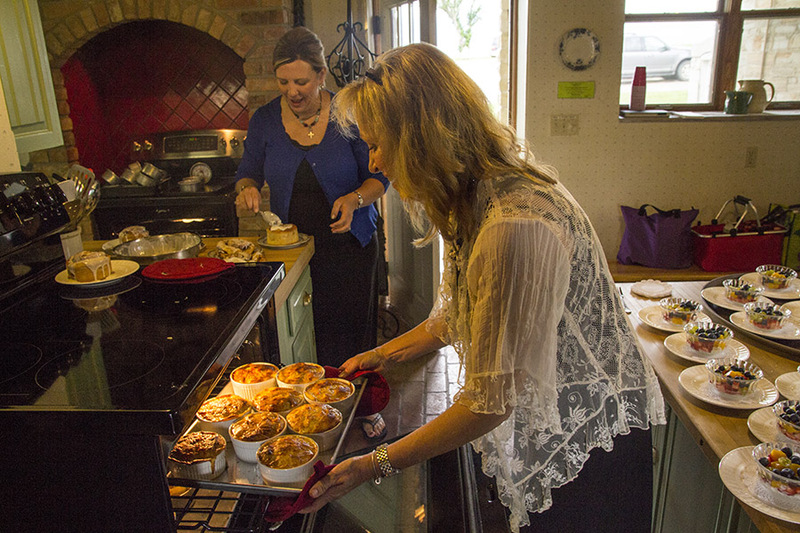 “It’s a great thing to pass on the gift of hospitality,” Susie said. Now that the main house and the gable house are both open to guests, the upkeep of Clover Cliff has become a full-time job, Susie said. To compensate for the additional work load, Susie and Warren hired some help to keep the place looking spotless. The hours of love and sweat the Harshmans have poured into their bed and breakfast have paid off, they explained. The reward has come on the grateful faces of satisfied guests. Warren choked up recounting two Wounded Warrior retreats the couple hosted at Clover Cliff. Wounded soldiers stayed at the bed and breakfast for a weekend and partook in long-range target shooting, shot clay pigeons and went on a turkey hunt. One soldier, who had lost limbs in battle, bagged a turkey with a bow and arrow — a feat that left Warren in awe, he said. Susie and Warren have bonded with visitors and seen relationships develop between guests. They have hosted group retreats and special occasion dinners. They have instructed their grandchildren in the finer points of hospitality. And they’ve only been in business a year. Though they said they do their best to make the stay at Clover Cliff as relaxing and pleasant as possible, the Harshmans know there is more to the estate’s appeal than top-notch customer service. The view from atop the hill does its part to keep guests coming back. Great article Jen. The cinnamon rolls looked yummy. Warren and Susie, we are so happy for you two. I have one of the books about the ranch and read it several years ago. No one could have been more perfect to bring back and carry on its tradition as a bed and breakfast. The story here is a perfectly accurate and vivid testimony of your love for Jesus, our Lord and Savior, all mankind, God’s children, and the Flint Hills country, a small yet one of the most beautiful parts of His creation. Praying for you as you work diligently together and enjoy this chapter of your life.